Family mealtimes not only bring everyone together but they foster social interaction. It's a time when you are free to talk about your day and make choices about your meal. While plated meals are easier, there is a push to family style dining in long term care to improve motor skills, provide freedom and initiate socialization. Eating family-style can be done in two different ways in a nursing home. One way is to place platters and bowls of food on individual tables, with four to six residents seated at the table. This encourages passing the platters and bowls, which is good for social interaction and maintaining muscle and motor skills for those who have them. On the other hand, those who are unable to lift or maneuver the trays will have difficulty with this, and can even hurt themselves or others by trying to do it. Another way that residential homes for seniors might offer more choices at meal times is to set up a buffet of sorts from which residents can take their own food. This option poses the same muscle and motor problems for some residents, with the added possible problem of mobility. While it is more common to find pre-plated food at nursing homes than at residential care facilities, many dining rooms for seniors offer plates of food at mealtimes, leaving no room for choice or spur-of-the-moment decisions on the part of the residents. Less food is wasted because the amounts of each dish are known before preparing the meal starts. For all of these reasons, many long-term care facilities for the elderly offer three meals a day, at set times, and give out plates of food to the residents at these times. 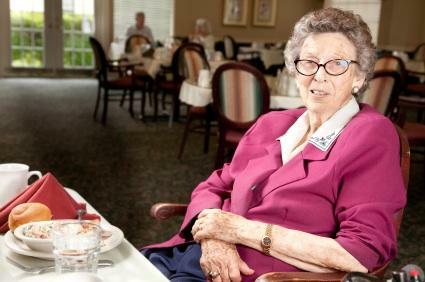 In many nursing homes, residents can fill out their meal choices for all the days of the week, choosing between two or three options that are offered at each meal.While having the ability to choose one's own food ahead of time is a step in the right direction, many seniors would rather choose what they eat at the moment they are going to eat it, not three days ahead of time. Many residents would prefer to choose not only what they eat, but also how much of each item they eat. Despite all the ways in which pre-plated food is easier in terms of serving, eating, and monitoring what residents eat, there is quite a movement towards a conversion to family-style dining in long-term care for residents who desire this change and are able to make healthy decisions regarding food. In a study carried out in Dutch nursing homes, two groups of residents were observed for six months following admission to the nursing home. While one group was served a plate of food at mealtimes, the other group had family-style eating experiences, and was able to make choices about which foods to eat on the spot. Three differences were observed between the two groups; namely, the group that had family-style meals had a better quality of life (according to their own perception), better motor skills, and were better able to maintain the weight they were at when they entered the nursing home than the group who received standard meals. This study is just one example in which the widely held view that family style dining in long term care is beneficial to residents has been confirmed. If you are specifically looking for a care facility that offers family-style dining, simply ask about it every time you go to visit a nursing home. Some facilities already offer this service, and many other nursing homes are moving towards this practice. If the facility where one of your loved ones resides does not offer this style of meals, you can bring the matter up with the director if you'd like to see the mealtimes change in the future. While serving set portions is easier for the staff and easier to monitor, the benefits when residents can make their own choices are many. Given this fact, many more nursing homes may be moving towards family-style dining in the future.